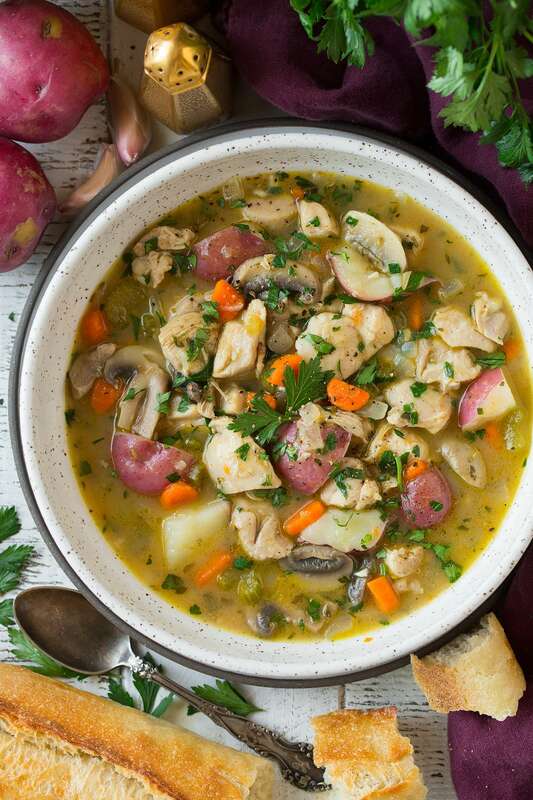 Chicken Stew is just what you need to cozy up to after a long day! It calls for simple ingredients that together create a delicious final product. 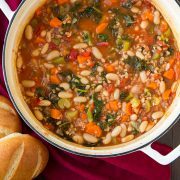 This is a hearty homestyle recipe everyone will enjoy! Soup, soup and more soup. It’s the best dinner in the fall and winter and it’s just what we crave on those dreadful sick days. 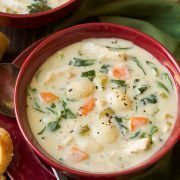 Plus soup recipes like this make the best leftovers! 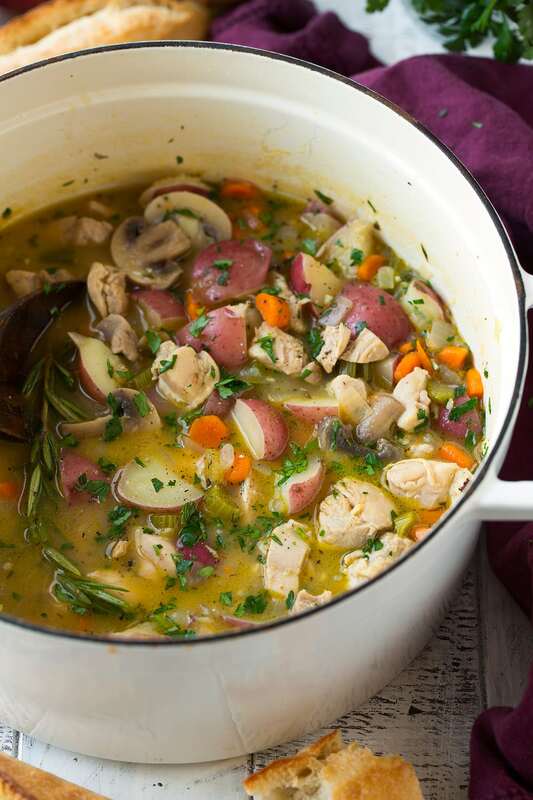 This soup reheats perfectly and the flavors just have that much longer to meld together. 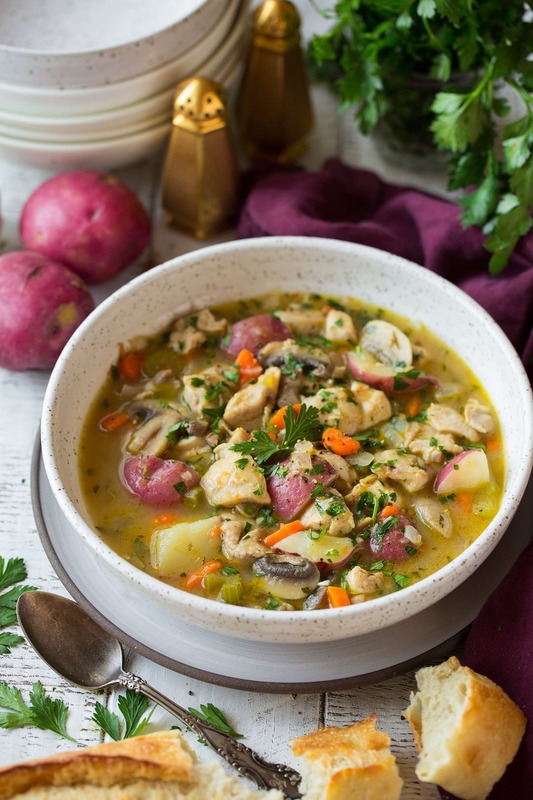 This chicken stew is filled with tender chicken, hearty veggies, and an incredibly flavorful broth. Talk about spoon after spoon of delicious! Saute carrots, celery and garlic. Pour in 3 1/2 cups chicken broth, potatoes, rosemary, thyme and seasoon. Bring to a boil then add in mushrooms and chicken. In a saucepan cook butter and flour. Stir in 1 cup broth, let boil and thicken. Pour flour mixture and parsley into soup mixture once soup is finished. I only recommend using the chicken thighs in this recipe. Chicken breasts won’t be as tender and flavorful here, plus they’d overcook and dry with this cooking time. Can I Use Dried Herbs instead of Fresh? Dried herbs can be substituted here if needed. Use 1/2 tsp thyme 1/2 tsp rosemary and 2 tsp dried parsley. 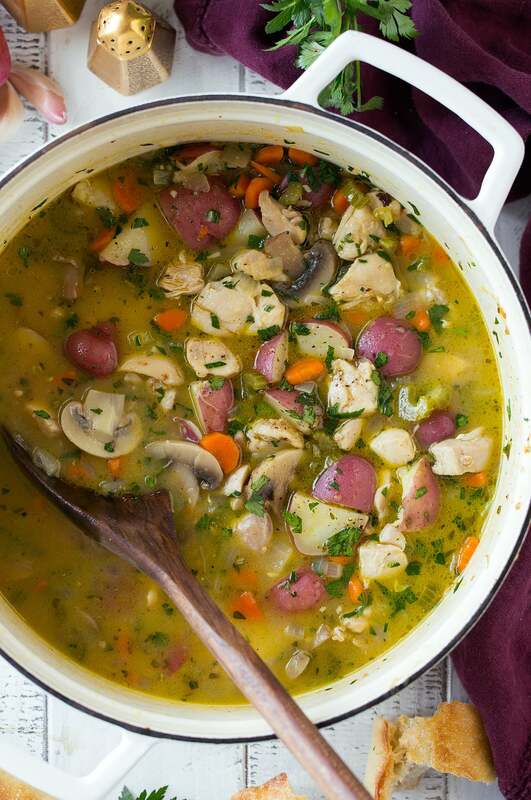 This homemade hearty stew just what you need to cozy up to after a long day! It calls for simple ingredients that together create something so delicious! It will make great leftovers if you're lucky enough to have some left. Heat oil in a large pot over medium-high heat. Add chicken and cook, turning once halfway through, for 6 minutes total. Transfer chicken to a plate leaving fat in pan (there should be 1 1/2 Tbsp, if not add in a little oil). Reduce heat to medium. Add in onions, carrots, celery and saute 5 minutes. Add in garlic and saute 1 minute longer. Pour in 3 1/2 cups chicken broth, potatoes, rosemary, thyme and season with salt and pepper to taste. Bring to a boil then add in mushrooms and chicken. 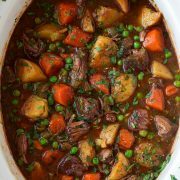 Reduce heat to medium-low then cover and simmer until potatoes are tender, stirring occasionally, about 25 minutes. During the last 5 minutes of soup cooking, in a separate small saucepan melt butter over medium heat. Add flour and cook whisking constantly, 1 minute. While whisking pour in remaining 1 cup chicken broth. Cook whisking constantly until mixture comes to a boil and thickens, remove from heat. Pour flour mixture into soup mixture once soup is finished. Stir parsley into soup and serve warm.